In the Constitution Ineffabilis Deus of 8 December, 1854, Pius IX pronounced and defined that the Blessed Virgin Mary "in the first instance of her conception, by a singular privilege and grace granted by God, in view of the merits of Jesus Christ, the Saviour of the human race, was preserved exempt from all stain of original sin." The subject of this immunity from original sin is the person of Mary at the moment of the creation of her soul and its infusion into her body. "...in the first instance of her conception..."
The term conception does not mean the active or generative conception by her parents. Her body was formed in the womb of the mother, and the father had the usual share in its formation. The question does not concern the immaculateness of the generative activity of her parents. Neither does it concern the passive conception absolutely and simply (conceptio seminis carnis, inchoata), which, according to the order of nature, precedes the infusion of the rational soul. The person is truly conceived when the soul is created and infused into the body. Mary was preserved exempt from all stain of original sin at the first moment of her animation, and sanctifying grace was given to her before sin could have taken effect in her soul. "...was preserved exempt from all stain of original sin..."
The formal active essence of original sin was not removed from her soul, as it is removed from others by baptism; it was excluded, it never was in her soul. Simultaneously with the exclusion of sin. The state of original sanctity, innocence, and justice, as opposed to original sin, was conferred upon her, by which gift every stain and fault, all depraved emotions, passions, and debilities, essentially pertaining to original sin, were excluded. But she was not made exempt from the temporal penalties of Adam — from sorrow, bodily infirmities, and death. "...by a singular privilege and grace granted by God, in view of the merits of Jesus Christ, the Saviour of the human race." The immunity from original sin was given to Mary by a singular exemption from a universal law through the same merits of Christ, by which other men are cleansed from sin by baptism. Mary needed the redeeming Saviour to obtain this exemption, and to be delivered from the universal necessity and debt (debitum) of being subject to original sin. The person of Mary, in consequence of her origin from Adam, should have been subject to sin, but, being the new Eve who was to be the mother of the new Adam, she was, by the eternal counsel of God and by the merits of Christ, withdrawn from the general law of original sin. Her redemption was the very masterpiece of Christ's redeeming wisdom. He is a greater redeemer who pays the debt that it may not be incurred than he who pays after it has fallen on the debtor. Such is the meaning of the term "Immaculate Conception." No direct or categorical and stringent proof of the dogma can be brought forward from Scripture. But the first scriptural passage which contains the promise of the redemption, mentions also the Mother of the Redeemer. The sentence against the first parents was accompanied by the Earliest Gospel (Proto-evangelium), which put enmity between the serpent and the woman: "and I will put enmity between thee and the woman and her seed; she (he) shall crush thy head and thou shalt lie in wait for her (his) heel" (Genesis 3:15). The translation "she" of the Vulgate is interpretative; it originated after the fourth century, and cannot be defended critically. The conqueror from the seed of the woman, who should crush the serpent's head, is Christ; the woman at enmity with the serpent is Mary. God puts enmity between her and Satan in the same manner and measure, as there is enmity between Christ and the seed of the serpent. Mary was ever to be in that exalted state of soul which the serpent had destroyed in man, i.e. in sanctifying grace. 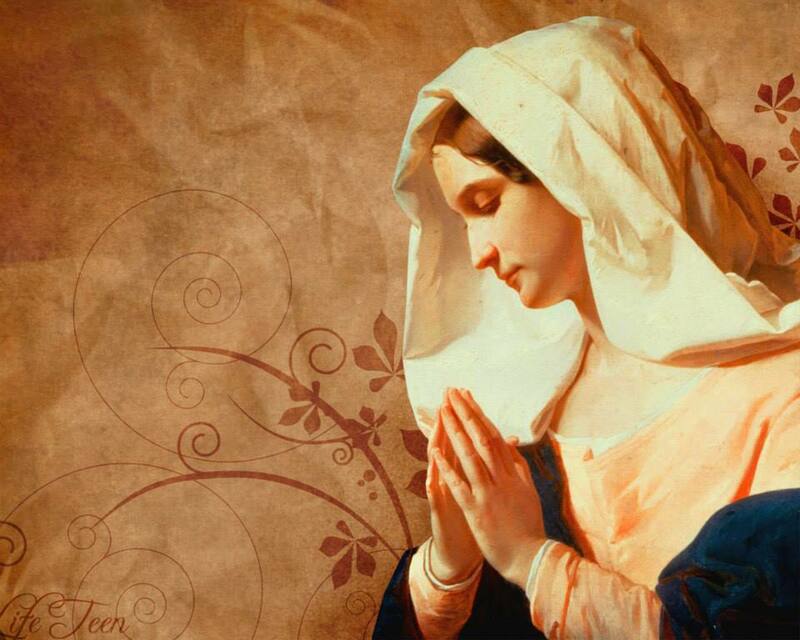 Only the continual union of Mary with grace explains sufficiently the enmity between her and Satan. The Proto-evangelium, therefore, in the original text contains a direct promise of the Redeemer, and in conjunction therewith the manifestation of the masterpiece of His Redemption, the perfect preservation of His virginal Mother from original sin. The salutation of the angel Gabriel — chaire kecharitomene, Hail, full of grace (Luke 1:28) indicates a unique abundance of grace, a supernatural, godlike state of soul, which finds its explanation only in the Immaculate Conception of Mary. But the term kecharitomene (full of grace) serves only as an illustration, not as a proof of the dogma. In regard to the sinlessness of Mary the older Fathers are very cautious: some of them even seem to have been in error on this matter. Origen, although he ascribed to Mary high spiritual prerogatives, thought that, at the time of Christ's passion, the sword of disbelief pierced Mary's soul; that she was struck by the poniard of doubt; and that for her sins also Christ died (Origen, "In Luc. hom. xvii"). In the same manner St. Basil writes in the fourth century: he sees in the sword, of which Simeon speaks, the doubt which pierced Mary's soul (Epistle 260). St. Chrysostom accuses her of ambition, and of putting herself forward unduly when she sought to speak to Jesus at Capharnaum (Matthew 12:46; Chrysostom, Homily 44 on Matthew). But these stray private opinions merely serve to show that theology is a progressive science. If we were to attempt to set forth the full doctrine of the Fathers on the sanctity of the Blessed Virgin, which includes particularly the implicit belief in the immaculateness of her conception, we should be forced to transcribe a multitude of passages. In the testimony of the Fathers two points are insisted upon: her absolute purity and her position as the second Eve (cf. 1 Corinthians 15:22). Irenaeus (Against Heresies III.22.4), Tertullian (On the Flesh of Christ 17), Julius Firmicus Maternus (De errore profan. relig xxvi), Cyril of Jerusalem (Catecheses 12.29), Epiphanius (Hæres., lxxviii, 18), Theodotus of Ancyra (Or. in S. Deip n. 11), and Sedulius (Carmen paschale, II, 28).